This year ends with a bang in Japan with 8 world title fights over the spaces of 2 days. 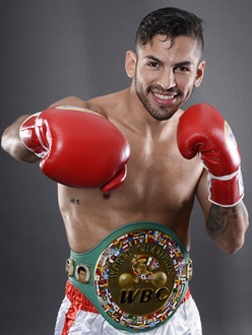 OF those 8 bouts only one doesn't feature a Japanese born fighter, that is the WBC Lightweight title fight between the Venezuelan born-Japanese based Jorge Linares (37-3, 24) and Mexico's Javier Prieto (24-7-2, 18). The bout is for the vacant title and the Teiken managed Linares will be hoping to becomea 3-weight world champion, adding the WBC Lightweight title to previous reigns at Featherweight and Super Featherweight. As a professional Linares has been adopted by Japanese fans. Of his 40 previous fights 22 have been in Japan, he lives in Japan, speaks Japanese and has long been a favourite of Japanese fight fans. In the ring he has shown traits that Japanese fans are familiar with, in fact in many ways he is similar to Japan's very own Hozumi Hasegawa. Like Hasegawa he has shown frailty, being dropped numerous times, he has fantastic handspeed, throws lovely combinations and is amazingly well skilled. In the ring Linares is one of the sports most beautiful boxers to watch. Offensively he has it all. Sadly however his offensive brilliance isn't matched by his toughness which is questionable, at best. All 3 of his losses to date have come by stoppage. One of those was a shocking opening round loss to Juan Carlos Salgado in one of the major upsets of 2009, one was a bloody 11th round TKO loss to Antonio DeMarco in a bout Linares looked in control of whilst the third was a cuts loss to Sergio Thompson. In all 3 losses it's seemed like Linares broke when he was hit back and questions remain not just about his toughness but also his heart and stamina. Whilst it may seem silly to question his stamina there is an amazing stat regarding Linaes, he has never gone 12 rounds, His longest bout to date was the loss to DeMarco. It was the only time in 40 fights that Linares has gone beyond the 10th round of a fight. For all the offensive qualities he has, and his experience, there are still a lot of questions that we don't know the answer to. Although there questions about Linares it's fair to say he is a much more known quantity than Preito who, in the eyes of many, is getting a very undeserved opportunity. Aged 27 Prieto is slightly younger than Linares though hasn't fought any where near the same level of competition. Regarded as a puncher Prieto is dangerous, at least at the lower levels. Sadly however it's hard to know just how good he actually is. His best win, a decision over Vicente Mosquera, looks like an anomaly and he has failed to beat anyone else of note, losing to the likes of Ali Chebah, Edgar Puerta and Roberto Ortiz whilst being held to back-to-back draw by Ivan Cano. Those results make us question just how legitimate Preito's power actually is. As well questions regarding Prieto's power and credentials we also aren't convinced by his skills or durability. In the ring he looks big and powerful but very slow, incredibly basic. It seems he has gotten as far as he has with a lot of luck as technically he does very little impressively and often stalks with out cutting the ring off or applying real pressure. In 33 fights he has never shown real world class ability or the potential to ever be world class. From what we've seen of the two men Prieto has just 1 thing Linares doesn't have, the proven ability to go 12 rounds. That's something that the Mexican has done 5 times, winning 2 of those bouts, drawing two and losing one. That advantage however, may be his sole advantage of Linares. In our view this is a stylistic dream for Linares, fighting a slower, wilder, open opponent who is there to be tagged clean at will repeatedly. The one danger Linares has is being caught by a wild shot that either cuts him or leaves him ready to be finished. In all honesty however Linares shouldn't get caught by something like that from Prieto who is likely to be kept at range by Linares footwork. What we're expecting is for Linares to fight at his pace, if not a little slower than usual, box and move, whilst making Prieto look silly for 12 rounds. Yes we're suspect a 12 round decision win for Linares. The Venezuelan may have a few hairy moments if he gets complacent.